Song, X.,Wang, S., Li, T., Tian, J., Ding, G., Wang, J., Wang, J. and Shang, K. 2018. The impact of heat waves and cold spells on respiratory emergency department visits in Beijing, China. Science of the Total Environment 615: 1499-1505. There is much interest in the effects of extreme temperature on human health and many scientists have examined this subject. The latest to do so is Song et al. (2018), who analyzed daily meteorological data and daily emergency hospital visits in the Haidian district of Beijing, China between 2009 and 2012. In doing so, they determined the relative risk of respiratory morbidity for both heat waves and cold spells of ≥2, ≥3 and ≥4 days of duration in which the average daily temperature fell within the 95th through 99th percentiles and 1st through 5th percentiles, respectively. And what did their study reveal? The relationship between ambient temperature and respiratory emergency department visits followed what the authors describe as a U-shaped curve, where the minimum relative risk value of 1.0 was observed at a mean daily temperature of 21.5°C, which temperature is a full 6.0°C warmer than the mean average temperature of the entire study period (i.e., 15.5°C). Given that this minimum-morbidity temperature is much higher than the mean temperature over the period of study, it indicates there is some form of human adaptability or respiratory morbidity acclimation to warmer weather taking place. Song et al. 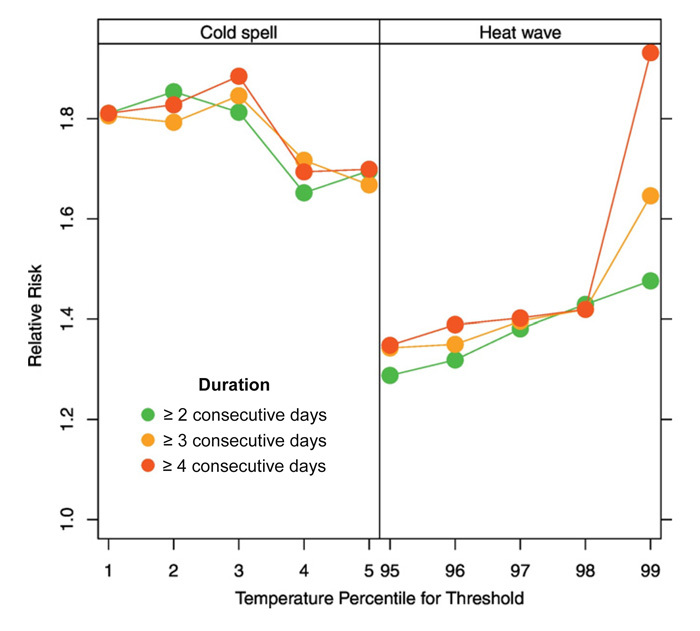 's work also revealed that the relative risk (RR) of daily respiratory morbidity due to cold spells is typically much greater (RR of ~1.7 vs RR of ~1.4) than that due to heat waves (see the figure below). The only exception is the RR for heat waves lasting for 4 or more days at the 99th percentile threshold. However, that data point is represented by only one total heat wave in the entire study and is likely an aberration skewing the results, given the closer relationship in RR values observed at the 95th through 98th percentiles. In light of these several findings, it would thus appear that the most effective policies designed to reduce respiratory emergency department visits should be targeted towards the higher relative risks observed at the cold end of the temperature spectrum due to cold spells. Figure 1. Relative risk in daily respiratory morbidity due to cold spells and heat waves in Beijing, China. Source: Song et al. (2018).